In spite of our wild fire, the Gregore and Jennifer-Rabe Jewelers shop in Santa Barbara is open for business. Lets hope for the sake of those honorable firemen fighting the fires and those fleeing their homes that they will have a good and safe Christmas after all. Lately we have been designing stud earrings. This fashion accessory is understated and feminine. 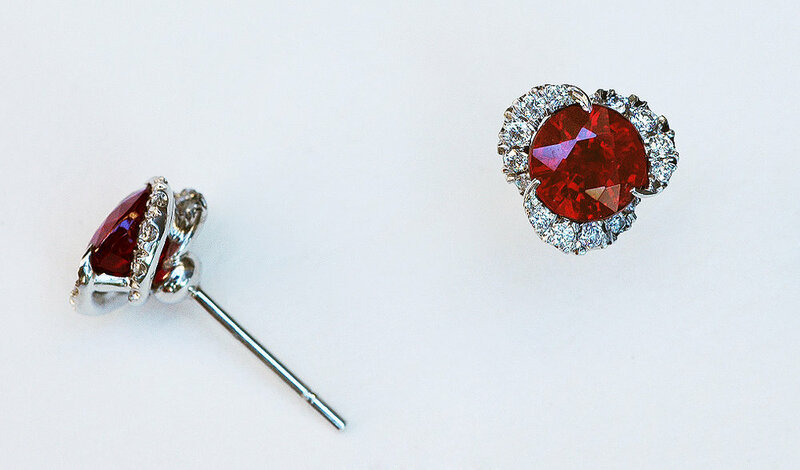 David Gross has lovely matched round pairs in blue sapphire and in ruby. It is too easy to just put them into a four prong setting. We wanted to create something unique and pretty. Gregore has a real flair for drawing with arcs. Though we both design for David we leave the final decision to him because he knows his taste better than anyone. The approved drawing becomes a CAD render to calculate material weights but also to let all of us see the object in 3D and from all sides. It's exciting to see it a lot sooner, because it takes time to make the actual product. CAD as I have mentioned before, helps tremendously because the model is symmetrical and repeatable with accuracy. The way the tool path looks is very unusual, as is the CAD model. If you are old school, working with your hands like we are, it's a new mental exercise to make sense of all the lines and colors on the screen. CAD render of the swirl earring. The CAD render is useful even though it isn't exactly how the finished product will turn out. You can get a good idea of how the earring, or engagement ring will look like without having to build all the intricate details that are accomplished with jewelry tools. The tool path for the cutter on the CNC is the strangest image of all. This is code that the carbide or diamond cutter will follow in space. Like with castings you need sprues, otherwise the parts will fall to the ground as soon as they are cut. I like how they look like a cartoon. These are the real deal, little tiny cast pieces that will be lovingly sanded to a fine finish and a high polish, while also being set with small diamonds and a center stone. We wish you could see the microscope, sharp tools, and concentration required to create fine jewelry. It's really intense. You can't think about much else. No doubt, jewelry is collected and treasured because of its exceptional detail. Gregore is a tool maker. Contact us if ever there is a tool you can't find. We can make it for you! This jig was cut on the CNC . It is merely the negative space around the tool path. It is also essential to hold the finished scrolls in place accurately. The jig and the metal parts are placed in the laser welder and tacked together for soldering. If the laser welder has done only one great thing, (it has done a lot more actually) it is to tack pieces together in their proper alignment for soldering purposes. I don't know if you remember the days of "third hands", pins, blocks, binding wires, plasters or simply a tweezer to hold items while soldering? The laser welder has solved a lot of problems. There are many steps that still have to be done by hand, and one of them is sanding in small intricate spaces. We sell kits of these sanding strips, more on this item later. James taught us this technique using superior materials. He is so missed. One of the best jewelers we knew. His wife Helen, a terrific jeweler herself, is doing a fine job running their jewelry shop . One of the final and most rewarding steps is setting the center stone. It is a unique setting technique. The end of the scroll is twisted following the direction of the arc, so it wraps neatly onto the gemstone. For these and other items of jewelry, whether custom or pre-designed contact us, we are here to serve, wishing to bring you joy.